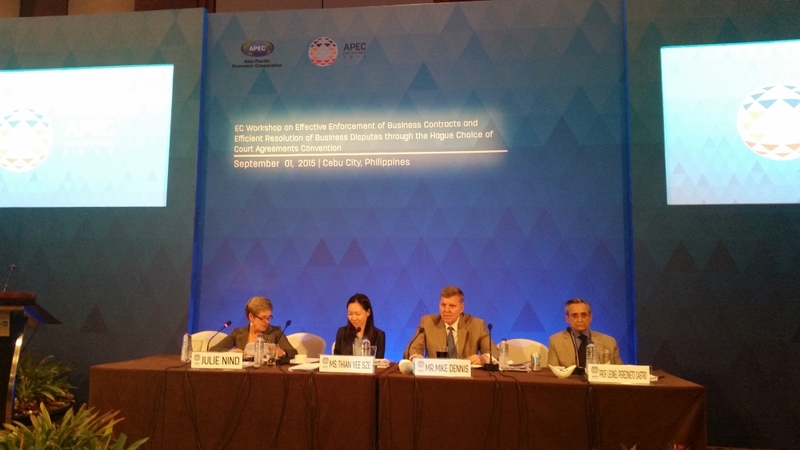 The Asia Pacific Economic Co-operation (APEC) Workshop on the effective enforcement of business contracts and efficient resolution of business disputes through the Hague Choice of Court Agreements Convention was held on Tuesday 1 September 2015 in Cebu, the Philippines, on the margins of the APEC Senior Officials Meetings. The Workshop is organised by the Department of Justice of Hong Kong, People's Republic of China, in collaboration with the Asia Pacific Regional Office of the Hague Conference on Private International Law (HCCH) and the UNCITRAL Regional Centre for Asia and the Pacific. The Workshop was attended by over 40 participants from the APEC Member Economies as well as international organisations, including government officials, judge and academic. Secretary General Christophe Bernasconi gave presentations during the workshop, focusing on in particular the important roles that the Hague Convention of 30 June 2005 on Choice of Court Agreements (the Choice of Court Convention) and the Principles on Choice of Law in international Commercial Contracts (the Hague Principles) play in facilitating trade and investment among APEC economies. He was accompanied by Prof. Anselmo Reyes, Representative of the Asia Pacific Regional Office of the HCCH in Hong Kong. Both the Choice of Court Convention and the Hague Principles promote party autonomy in the context of international commercial contracts, thereby providing legal certainty and predictability in cross-border business transactions. Whilst the Choice of Court Convention, which will enter into force on 1 October 2015, facilitates resolution of business disputes by respecting parties' choice of court clauses in their business-to-business contracts, the Hague Principles acknowledge that parties to a contract may be best positioned to determine which set of legal norms is most suitable for their transactions. As a non-binding instrument, the Hague Principles can be used as a comprehensive blueprint to guide users in the creation, reform, or interpretation of choice of law regimes at the national, regional, or international level. Support received from the APEC economies will further raise the awareness of and the interest in these two instruments in the region. The Report of the Workshop, which includes the Conclusions and Recommendations adopted at the end of the Workshop, has been endorsed by the APEC Economic Committee. The Report is available here in English.